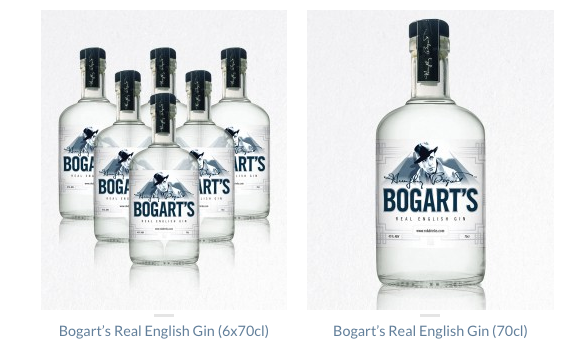 As Bogart’s Gin launches in the US next month, there’s good news for Bogie fans in the UK too as you can now buy bottles directly from ROK Drinks. This entry was posted in Film Noir, News and tagged Bogart's Gin, Humphrey Bogart, The Humphrey Bogart Estate on February 21, 2015 by Damian Michael Barcroft. There were many great movie stars during the 30’s, 40’s and 50’s. Many of these, James Cagney, Edward G. Robinson, Paul Muni and George Raft, to name but a few, were his onscreen as well as professional rivals. None, however, have endured in the popular imagination as much as Humphrey Bogart. From the birth of the Bogie persona in The Petrified Forest (1936), to his first true breakthrough “fully fledged” role in The Maltese Falcon (1942), the star-making performance in one of Hollywood’s greatest films, Casablanca (1942) to more introspective and mature characterisations in The Treasure of the Sierra Madre (1948) and The African Queen (1951) – not to mention those classic collaborations with his wife, the late great Lauren Bacall, the silver screen’s hottest couple in To Have and Have Not (1944), The Big Sleep (1946), Dark Passage (1947) and Key Largo (1948), Bogart’s cinematic legacy continues to prosper. Indeed, he has been voted the greatest movie star of all time. 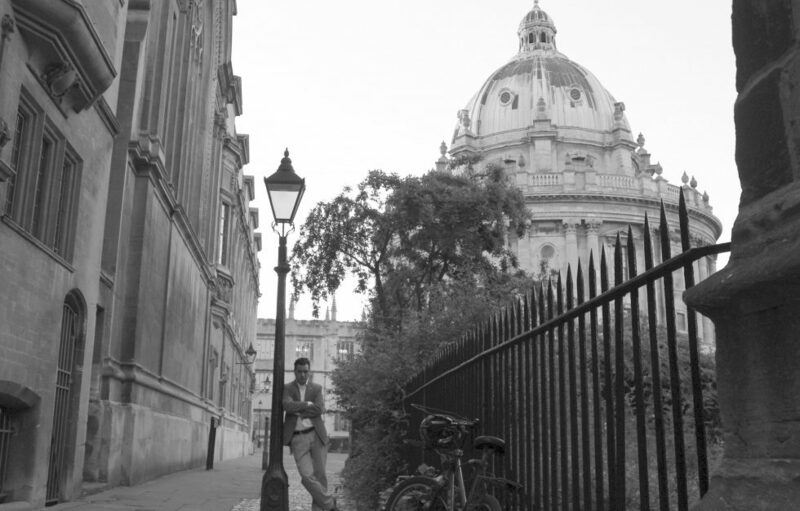 Damian: Like every other Bogart fan around the world, I can’t wait to get my hands on a bottle of Bogart’s Gin, but can you tell me how this all got started – was it the Bogart Estate or the guys at ROK who came up with the initial idea? Bruce: This is really a story about perfect timing. Around the time that we were getting ready to bring our gin to market, we were introduced to the Bogart Estate. We already knew we had the best quality gin so, when we were presented with the possibility of making one of Hollywood’s biggest icons, who was also a true gin lover, the face of our gin, the decision was easy. Robbert: At the Bogart Estate, the key to any partnership is authenticity. We have been approached many times with requests to lend Bogie’s name to a drink. We have always said no. Sometimes because it was a drink Bogie didn’t enjoy, and sometimes because the drink wasn’t great. And then we were introduced to ROK Drinks. Not only were they getting ready to launch a gin, which was one of Bogie’s very favorite drinks, but the gin was absolutely top notch. And on top of that, you can’t ask for better partners than ROK’s co-founders, John Paul DeJoria and Jonathan Kendrick. It was clear to us that this was the right time to take the plunge. Damian: What was the reaction from Stephen Bogart, son of Bogie and Bacall? Robbert: Stephen is my co-managing partner at the Bogart Estate, and he was involved from the very beginning. He has always been very clear that the first priority of the Bogart Estate has to be to protect and promote his father’s legacy. He absolutely loves Bogart’s Gin, and agrees ROK Drinks is the right partner to launch a spirit bearing his father’s name. Damian: And how has the spirits industry received the product? Bruce: The reaction has been both overwhelming and positive. We were frankly a bit surprised by how broadly our launch announcement was covered. We’ve been fielding product requests and distributor inquiries from just about every region in the world. 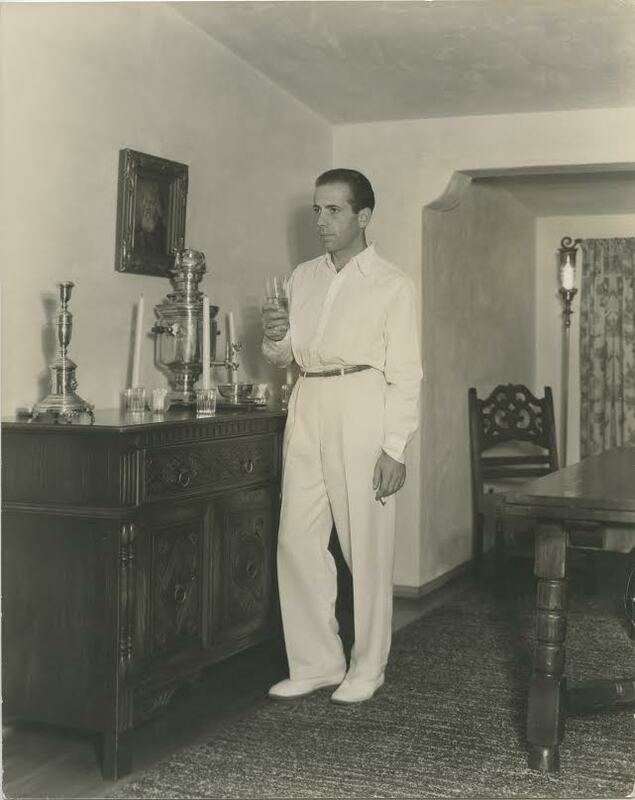 Damian: Bogart was born in 1899 and often described himself as a last-century man. Indeed, gin was a favourite drink during the Victorian era but I’m wondering why its popularity is increasingly on the rise? Bruce: It’s premium gin which is seeing a big uptake in many parts of the world – particularly artisanal pot-still gin – because, we believe, people are increasingly appreciating the delicate, subtle and complex flavours which many upscale gins now have. Bogart’s Gin, for example, is infused with coriander, macadamia nuts and citrus zests. Damian: Apparently, there are over 700 different gin cocktail recipes – what can you recommend? 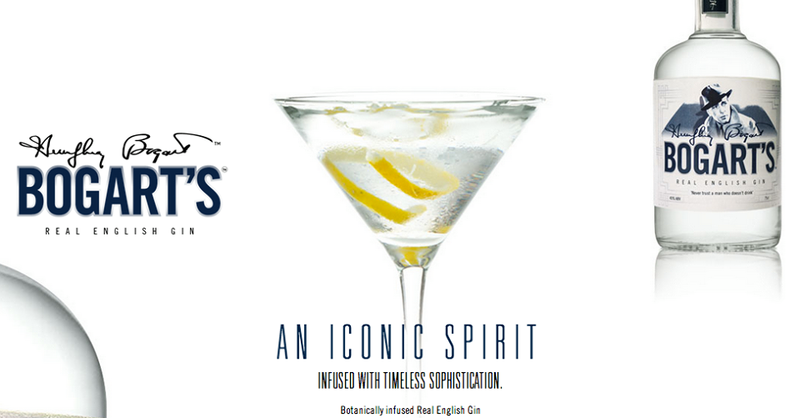 Bruce: Bogart’s Gin is of such high quality that you can actually sip it neat. It also goes very well with a slice of cucumber. 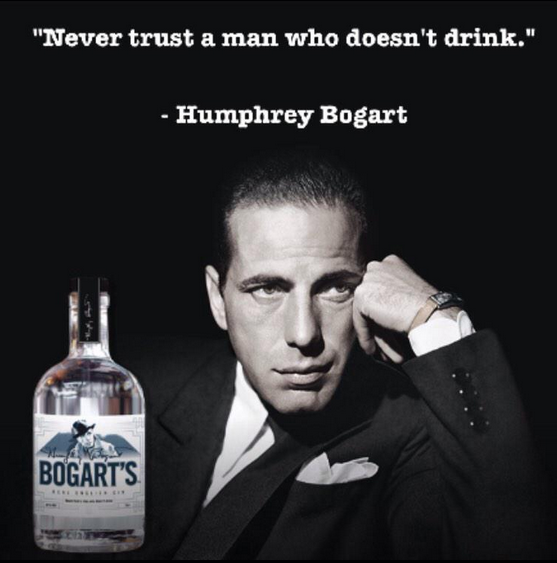 And you’ll never taste a better gin & tonic than one made with Bogart’s. Damian: I heard it was a Dirty Martini but do we know what was Bogart’s personal favourite? Robbert: You heard right. Bogie loved martinis, and the dirty martini was very popular in the 40s and 50s. It’s great to see classic cocktails making such a big comeback recently. If you ask us at the Bogart Estate, a real martini is made with gin, not vodka. Damian: Each bottle will contain one of Bogart’s classic quotes. For gin enthusiasts and movie fans, who will undoubtedly want to collect the lot, can you tell us how many different bottles there will be and give us a few examples of the quotes? Bruce: Well, that will depend in no small part on what we’re allowed to put on the bottles. Humphrey Bogart said some great things about drinking, but some of his quotes might not pass muster with the relevant authorities! Lucky for all of us, he was a very quotable man, and we have plenty of material to choose from. All I can say is that we’ll do what we can to bring you as many of his quotes as possible! Damian: There’s a great story about Bogie enjoying drinks with a few friends at the New York nightspot, El Morocco, in 1949. Apparently, they were accompanied by two 22-pound stuffed pandas and words were exchanged because the waiter refused to serve them. Recalling the incident later to a reporter, Bogie said, “I can take my Panda any place I want to. And if I want to buy it a drink, that’s my business.” Please tell me this quote will be on one of the bottles? Robbert: That incident is famously known as “Panda-gate.” A young lady seeking attention tried to grab the panda. And Bogie, who bought the panda for Stephen, prevented her from taking it. She actually pressed charges, and Bogie was acquitted by the judge, who ruled that Bogie rightfully defended his property and that the woman acted up at the urging of the night club’s publicist. Bogie gave that great quote on the courthouse steps. If we can fit it on the bottle, we may well include it at some point! Damian: When will Bogart’s Gin be available to buy both here and the US? 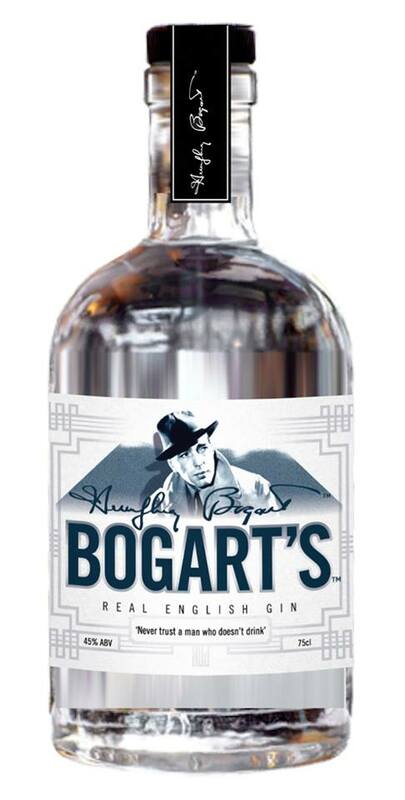 Bruce: We plan for Bogart’s Gin to be on the shelves in time for Christmas. This entry was posted in Film Noir and tagged Bruce Renny, Humphrey Bogart, Robbert de Klerk, ROK Drinks, ROK Stars PLC, The Humphrey Bogart Estate on September 23, 2014 by Damian Michael Barcroft.